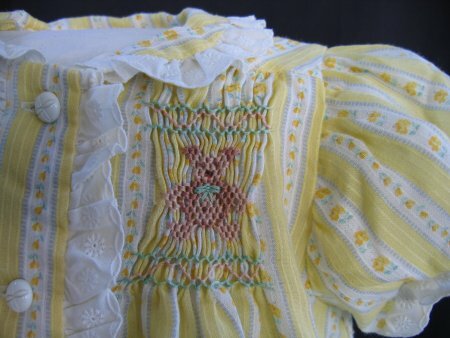 Yellow/white striped dress: stacked cable bear; top/bottom borders of waves & cable stitches. Origin of bear is unknown. 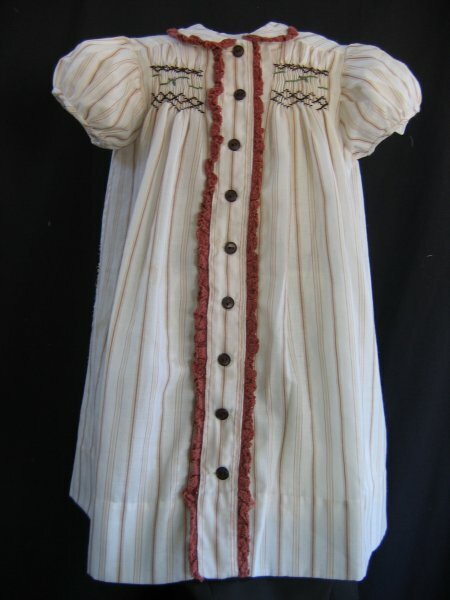 White/brown striped dress: "Claire Marie" by Terry Jane Inc. Fabric: both look like a type of leno weave to me, but I can't be sure. 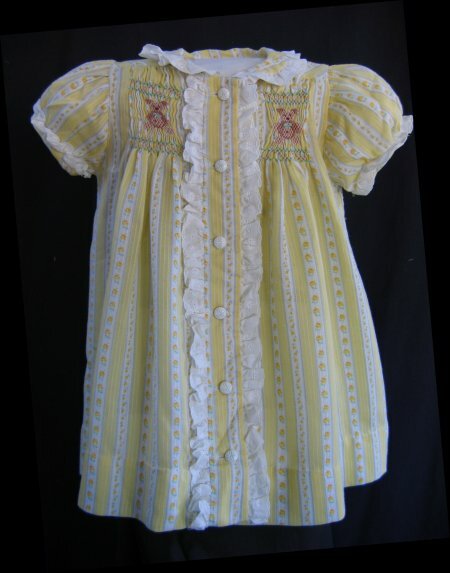 The yellow/white striped dress has an embroidered eyelet trim around the Peter Pan collar, on the short, puffed sleeve band and down the front placket. 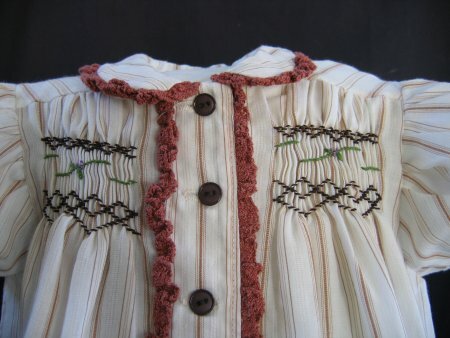 The white/brown striped dress has a deep brown scalloped crochet trim around the Peter Pan collar and down the front placket. 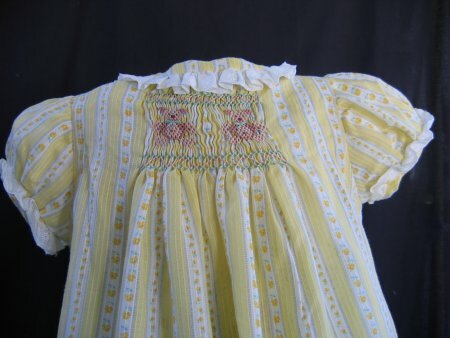 It was sometime around 1985 maybe that I made the yellow/white striped dress. I remember because Catherine (first born daughter) was still a young toddler. I was a member of our local SAGA guild and became aware of of home-based shop that member of the San Francisco guild had. So, bundling up my young daughter, I made the trek across the Bay from our home in Walnut Creek to the home of the other member, someplace on the San Francisco peninsula ... probably about a drive of 50 miles or so. The shop was delightful and one sample garment was "maggie" done in a lovely yellow fabric. Unfortunately, by the time the drive and visiting was done, it was waaaaaaaaaaaaaaaaay past Catherine's nap time. A very cranky toddler pitched a hissy-fit .... she wanted the yellow dress .... no other dress would do. It didn't matter that Mom could do it; she wanted THAT YELLOW DRESS. Obviously the dress wasn't for sale. This was entirely my error of judgement ... I never should have done such a long trip with her in tow. It was really unfair to her. I'm thinking that she probably fell asleep in the car during the ride home. It was a lesson that wasn't soon forgotten ... plan trips carefully! Remembering how much she (apparently) liked the dress, I made the yellow/white striped one for her. I don't remember if she liked it or even remembered the yellow dress from the shop. 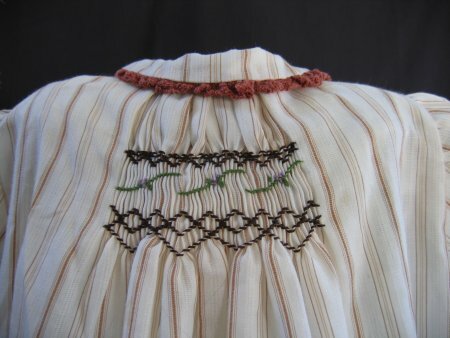 But *I* liked the dress so much that I made it again in a larger size using the white & brown striped fabric. Both dresses have French seams. However, in looking at the white/brown dress now, I see that I really did NOT line up the fronts properly ... boy, that was some sloppy sewing.